In 1945 the E 75 was conceived as a standard heavy tank of the Panzerwaffe to replace the Tiger II. It existed only in blueprints. 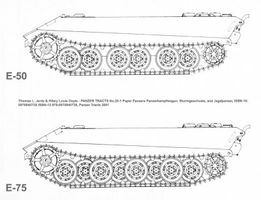 The first heavy tank in the Entwicklung series. It has very thick sloped armor, rivaling that of the ST-I, but with one great advantage; it doesn't have the frontal viewport weakspot. Stock it is armed with the inadequate 8.8 cm KwK 43 L/71, but can also use the 10.5 cm KwK 46 L/68 from the Tiger II so make sure to research it before using the E-75, unless you want a terrible grind. Eventually, you will have access to the very powerful 12.8 cm KwK 44 L/55 that packs a sizable punch up close or afar. 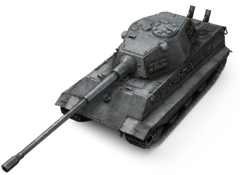 The E-75 can be used for multiple roles due to its immense armor and great weaponry. Of the tier 9 and 10 heavies the E-75 is one of the slowest, with only the Maus having a slower top end speed. The E-75 has sluggish turret and hull traverse speed, making it difficult to move around. While the E-75 is one of the easier tanks to flank, it is still harder to damage once flanked thanks to its relatively thick side armor. Traversing your hull along with your turret helps you keep up with enemies better if they get too close. Speed and agility aside, it is a versatile tank. You can be a close range brawler relying on your armor and firepower to keep you alive, or you can be a far range sniper with good accuracy and damage. The E-75 is one of the most dynamic heavies of its tier, with thick hull and turret armor coupled with an excellent gun. In situations in which your armor does not hold out against enemy fire, you have enough hitpoints to last a while you're under fire. Upgrading the engine would allow you to keep pace with the battle line in sniping your opponents. This page was last modified on 22 September 2014, at 19:18.